The Islamic Cultural Centre held in partnership with the London Saudi Students' Club an evening of celebrations on the occasion of World Arabic Languages Day on Sunday 18th December 2016. The Event was in spirit of the United Nations Educational Scientific and Cultural Organisation - UNESCO's annual World Arabic Language day. Distinguished guests of the evening celebrations included Cultural Attaches of Embassies of the Trustees of the Islamic Cultural Centre, Academics, scholars from Kuwait and students from across London and other cities providing a platform to highlight the historical role of the Arabic language in research and the dissemination of knowledge, and the importance of multilingualism for the research community today. Dr Ahmad Al Dubayan - Director General of The Islamic Cultural Centre in his opening speech welcomed the august gathering and congratulated all on the occasion of the World Arabic Language Day 2016. 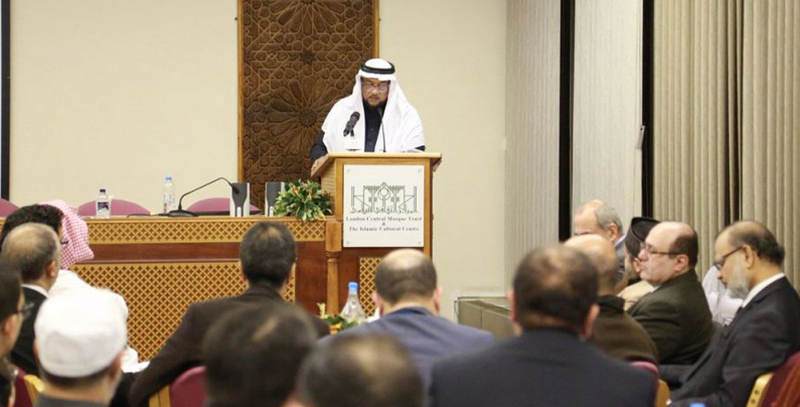 In this spirit, The Islamic Cultural Centre welcomed an evening of talks on the Importance of Arabic Language in todays society by Dr Nabeel Al Haidari, Arabic calligraphy and fonts delivered by Sheikh Dr Jasim Al Enti of The State of Kuwait and epistemology and history of the Arabic Language by Dr Al Dubayan. The event also welcomed recitation of Arabic poetry and modelling of different projects for promoting and teaching Arabic Language in Non-Arab Countries. The Islamic Cultural Centre, which holds many Arabic intellectual events such as the Cultural Salon and Arabic learning courses, stressed on the prominence Arabic Language yields and commented on the desire for more students to learn Arabic in the UK for religious purposes and encourage a greater understanding of Arab culture. President of The London Saudi Students' Club Mr Ghalib Saeed payed tribute to the Islamic Cultural Centre and Director General Dr Ahmad Al Dubayan for hosting and partnering on the event which was a testament of the prominence and value of Arabic Language by Students in the United Kingdom. Mr Saeed also thanked the Saudi Arabian Cultural Bureau of The Royal Embassy of Saudi Arabia and The Acting Cultural Attache Dr Fahad Alnoeim for the leading role the Bureau plays in supporting student activities and providing governance to better promote and showcase the Arab culture and language in the UK.